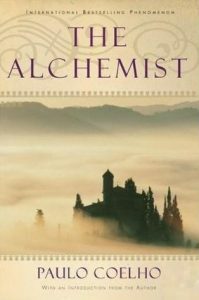 A few years back, the book everyone was talking about was THE ALCHEMIST by Paulo Coelho. I saw the book everywhere; online, in bookstores, in peoples’ hands, and everyone was saying what a fantastic book it was. It was recommended to me by several people, and I was both loaned a copy (that I – gasp – still have) and gifted a copy, but for whatever reason I never got around to reading it. I always believed that someday I would, but meanwhile my reading life went on, and very busily so, with many other books. So when one of the gals in my book club chose it for this month’s read I was actually pretty jazzed. I would no longer be able to put off reading it because I didn’t want to be a flunkatoid – that’s the title we give ourselves in my club when we fail to read the book that’s been chosen. And I had two copies to read already! I only had to find one of them. Perhaps the reason I’d previously put off reading it was that I had heard it was allegorical, and a bit mystical, and about a shepherd boy (who, by the way, is not really a boy at all actually, but a man.) I had heard that it was enlightening, inspiring and philosophical. I like all those things, but I usually read fiction for pleasure and nonfiction for research, and allegory for nothing. But I was ready at last to read the book everybody had been talking about and that has sold millions upon millions of copies. Here’s the thing with a book that all the world loves; your expectations of it are extremely high. Stunningly high, at least for me. I was ready to be wowed, undone, amazed. And while I enjoyed it, I finished the book a bit underwhelmed and kind of sad. I wish now I had heard nothing about it. And I also think I should’ve kept looking for the new copy that I have somewhere here in this house and hadn’t settled for the friend’s copy which had been underlined already. I would see those underlines coming up and I would feel like I was stumbling upon someone else’s discovery. I wanted to have my own discoveries, and when you read a borrowed book with underlines already inside, you don’t get them. And I do believe this is the kind of book where you need to have them. Yes, yes, yes, I am a fan of all six of these pearls of wisdom. But in the reading I’ve discovered I don’t want to dive for pearls of wisdom by way of allegory. I did when I was a kid, but I don’t now. 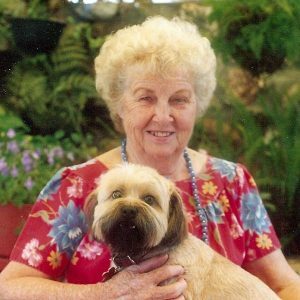 I am fully of the persuasion that there are life lessons to be learned, but not all life lessons are learned the same way. My preferred learning style (I know this now) is to hear a lecture or read an essay rather than read a work of allegorical fiction. And I absolutely need to make my own highlights. 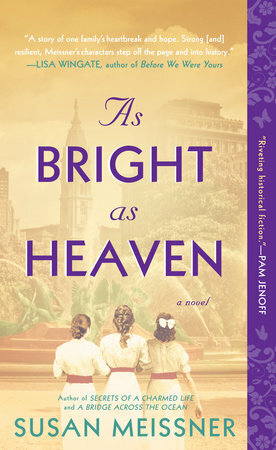 In my search to figure out why I didn’t adore the book everybody adored (I LIKED it friends. I did), I came across the article and was astounded that this book was written in only two weeks. You might also want to know that it was not a success until it was translated into English, and that it spent 300 weeks on the NY Times bestseller list. Click to read the rest of the article. What this book’s phenomenal success tells me more than anything is that people are hungry to know their purpose in life. I find that wonderfully refreshing because it quietly speaks that at our core, we know we are more than former primordial ooze. We were made in the image of God, we absolutely do have a purpose, and our souls are restless until we discover it. I am glad this book encouraged so many to discover for themselves what it is. And now, of course, I would love to hear your thoughts! It’s been way too long since I’ve posted on the blog and I feel bad about that. The holidays, as they often do, got in the way of normal routines because I let them, and then in January, I began in earnest to write a new book – about which I will keep you in the loop in future posts – and I let that heady experience also keep me from feeding this blog on Fridays. I apologize. But I’m back in the saddle today with a book recommendation. Last month (I have to say that because January is already GONE!) that I absolutely loved. 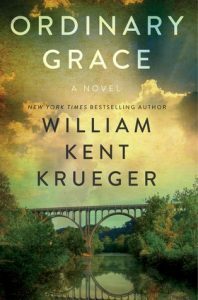 Ordinary Grace by William Kent Krueger is a five-star book all the way around. 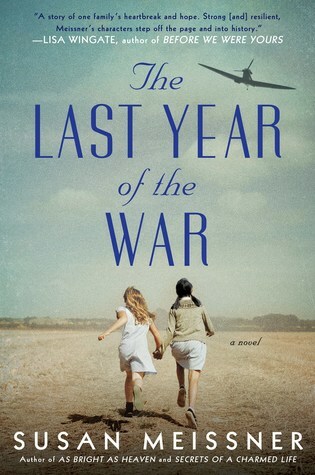 The title was a new one for me and was the choice of one of the readers in the book club I am in. 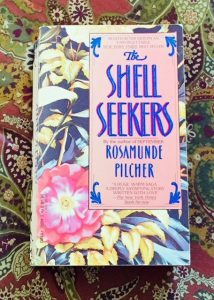 I was surprised – still am – I hadn’t heard of this novel because it is masterfully written and it has been out for several years. The story is one of those where the narrator in midlife is looking back on his childhood and sharing about an experience that forever shaped him. It’s also set in Minnesota, which is where I lived for 13 years, and pretty much in the same area, so I could see, taste, touch, and feel nearly every scene. Frankie is the 13-year-old son of a small town Methodist minister. He has a younger brother, who, incidentally, was my favorite character because of his tender heart, funny lines, and aching vulnerability. Frank tells the story of a particular summer where death had hold on their little town, in many different ways – from the tragedy of a little boy playing too close to train tracks to suicide to a murder. It was a summer like no other for lots of reasons but certainly because life itself was being dealt a blow. And when life is dealt blow we who know that life is precious can’t fail to wonder what impact it will have on us. I hesitate to share more about the storyline because I do not want to spoil it for you. Suffice it to say I was compelled to keep reading, and I didn’t want it to end. I’ve long known and loved the verse in the letter to the Corinthians Krueger references here, but I have never thought of those three graces – faith, hope, and love – that way; that they are ours to hold onto and ours to let go of, but that they can’t be stolen from us. Only abandoned by us. The thought still moves me. 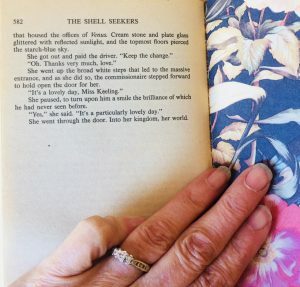 There were other portions of the book that were like this, deeply part of the story, but deeply relevant to our real lives outside the novels we read to escape them for a bit.